London — Bloomberg unveiled its new European headquarters today at an event hosted by its founder Michael R. Bloomberg in the company of Sadiq Khan, Mayor of London and the building’s architect Lord Foster, Founder and Executive Chairman, Foster + Partners. Located in the heart of the City of London, it is the first wholly owned and designed Bloomberg building in the world. Designed to facilitate collaboration and fuel innovation, it will bring Bloomberg’s 4,000 London-based employees under one roof for the first time. The building responds to its historic context, yet is uniquely of its place and time. It is a true exemplar of sustainable development, with a BREEAM Outstanding rating and the highest design-stage BREEAM score ever achieved by any major office development in the world. The 3.2 acre Bloomberg site encompasses three public plazas, providing new civic space in the heart of the City. Bloomberg Arcadedivides the site and returns a lost portion of Watling Street – an important Roman road – back to the city grid. The covered dining arcade features a variety of independent restaurants and serves as a new pedestrian thoroughfare. At each end, it is defined by a major new public artwork by Cristina Iglesias that creates a place of repose among the City’s dense fabric of streets. Art plays a central role in the project, with eight major contemporary commissions in and around the building. The Mayor of London Sadiq Khan, said: “This fantastic new building is a huge vote of confidence in London as a destination for global business. It is also a shining example of what can be achieved by combining fantastic British architecture and the latest green technology to reduce our impact on the environment. 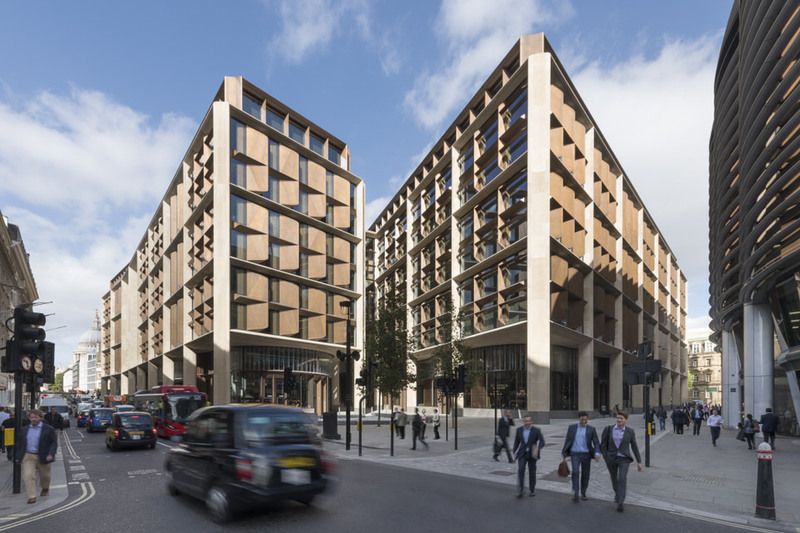 Designed to complement historic neighbouring structures and to age gracefully with time, the Bloomberg building is the biggest stone project in the City of London for a century. It features 9,600 tonnes of Derbyshire sandstone and blends locally sourced, natural materials with the best of international craftsmanship. The development also represents a major investment in the UK economy. According to a privately commissioned economic impact study, almost 90% of the project’s expenditure was retained in the UK over the course of construction. Around half of that was spent with local suppliers in London, including the employment of 13,500 construction workers (9.5 million man hours). Bloomberg’s new European headquarters is located on one of the UK’s most significant archaeological sites, home to the ancient Temple of Mithras and at the heart of what was Roman London’s commercial centre. Opening next month, an eagerly awaited new cultural hub – London Mithraeum Bloomberg SPACE – will restore the Temple of Mithras to the site of its discovery. Open to the public and free to enter, it will showcase the reconstructed temple, a selection of the remarkable Roman artefacts found during recent excavations, and a series of rotating contemporary art commissions responding to the site’s history.